I am a 50s baby and my early memories include ironing day. I love the smell of hot cotton and linen! Mamma and Grandma always sewed and ironed together, and I learned to do both while I was young. I recently started sewing baby clothes and many people commented how 'old fashioned" or vintage or retro they looked. I did not see it, but I was using patterns from the 70s as well as re-issued 50s looks. Then I started collecting vintage patterns and making the look more deliberate. I am still experimenting and trying options. The most important is that the clothes be comfy and easy to use. 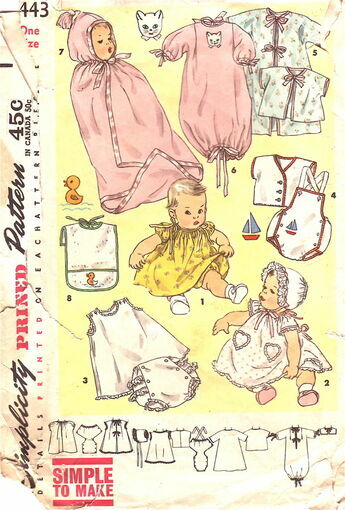 I’ve posted an infant dress from view 2 of this pattern. I like it enough I decided to make it bigger. My first try at making it a size two was so big that with the hem let down it fit a size 6. I did a second one and got closer to size two. The photo shows the dress before hemming. I feel I am not done with these yet. Sash maybe? The smaller dress needs a brighter accent, but I am proud of the bias binding I zigzagged around the sleeve openings. I make the neck opening with a casing and tie so the neckline is adjustable. These dresses should grow at least 2 years. Maybe more. Any thoughts on the styling? My idea is something between the simplicity of a pillowcase dress but more attractive than most peasant dresses. I like this pattern because of the wider shorts like legs. More comfy for chubby baby thighs. The back needed elastic and the straps were long, so I made them adjustable. Here it is part way done being modeled for adjustments. I sewed up the sides for this, to make sure it was OK before adding snaps and that gave me the idea to make a second one without snaps. What do you think? Snaps or no snaps? I used this pattern to make a party dress for a one year old. 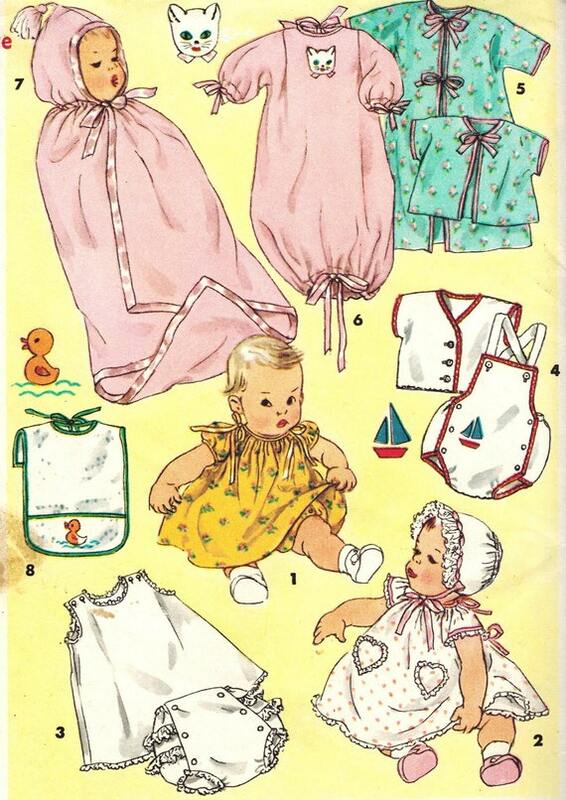 The older patterns certainly used more fabric. Look at this layout. I posted the sunsuits I made from this pattern a while back. It’s been too long since I made a new vintage style, but this week I finally put together this little pinafore dress. I love the little cap sleeves. It took me quite a few tries to figure out how to bind the edges. Worth it in the end, as shown below. I adjusted this pattern so it has an adjustable neckline. It is a layette item and will fit at least as small as 3 months, if not younger. I tried it on a six month baby and then just for fun on the three year old sister. It was really cute on both. As the child grows the neckline expands and the dress becomes a top to wear with shorts. So sweet! I’m not really sure about the back ties. The original calls for bias tape. I do not like the ribbon that is currently sold, but I liked the lighter weight of it. I ended up with these self fabric ties, something like the bias called for, but wider. Not sure how I will do the next one. And finally, another boy sunsuit. I am so excited about several new to me vintage patterns I recently acquired. I jumped right into making this sunsuit. The original pattern calls for bias edging and plastic lining. I used muslin instead, and added a 1/4 in seam allowance. It helped to make the leg hole just a bit bigger, by not adding the seam allowance there. Note the elastic at the leg. I used KAM snaps and a variety of trim options. Boy version with applique and no ruffles. Someone said this was not boyish enough for boys, but they are 3 months size, so I think it is fine. I am already working on another. I love the sweet simplicity of this pattern. It is very easy to make.